Biotin is also called vitamin H and vitamin B7. It is helpful in maintaining your body’s metabolism, along helping you to have healthy nails and hair. While it’s true that biotin is often beneficial to your body, taking too high a dosage can cause a variety of side effects. They include allergic reactions, acne, drug interactions and even miscarriages. Biotin is a B-complex vitamin that is water-soluble. It helps very specific enzymes in the body to function at their peak efficiency. Biotin is available in many food sources, including strawberries, brewer’s yeast, raspberries, royal jelly, cauliflower, cow’s or goat’s milk, cabbage, eggs, dried fruit, oats and cucumber. Your daily recommended dietary allowance for biotin, however, is quite low. Children should receive no more than five to 12 biotin units per day. Adults should take no more than 20 to 30 units. It is quite rare for a person to have a deficiency in biotin, but it is not inconceivable. If someone suffers from a deficiency of biotin, they can take supplements to bring their biotin up to their proper levels. Understanding the need for biotin and the potential side effects will help you to properly determine whether you need to supplement your biotin levels at all. There are very few people who have allergic reactions when taking biotin, but reactions are possible. If you’re allergic to cobalt or vitamin B12 cobalamin, you’re more likely to be allergic to biotin, too. If you’re currently suffering from a biotin reaction, you may experience pain or tightness in the chest, swelling of the face or throat, an itchy rash or nausea. Consult your physician right away if you begin to experience these symptoms. Some of them can be fatal. If you take in too much biotin for your system, it will increase the risk that you will develop cystic acne along your jawline and chin. It is not known why this occurs, but the acne will usually fade several weeks after you discontinue your biotin supplements. If you’re taking biotin, be sure that your daily doses are lower than 2500 mcg. Drink lots of water to reduce the risk of acne development. You may experiment with lower doses until you find an amount that will work for you without affecting your skin. Don’t take high biotin doses if you are pregnant or trying to become pregnant. It may increase your miscarriage risk. There is no clear reasoning on why there is this link, and no human tests have been performed to get a clear percentage on the likelihood of miscarriage. Speak to your OB-gyn before you take biotin while you are pregnant, to ensure that you’re safe. Biotin is marketed under a variety of names, including coenzyme R, biotine, biotina, vitamin H, vitamin B7 and Appearex. Many B-vitamin supplements and multi-vitamins contain biotin, as well. 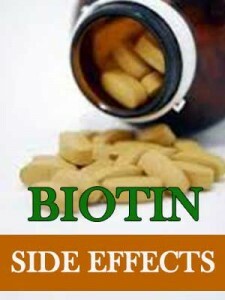 Biotin interacts negatively with cholesterol-lowering medicines and anti-seizure medications. It makes them less effective. While biotin helps to regulate your blood sugar level and metabolism, it can have an effect on your overall body blood glucose level. If you take anticonvulsant or cholesterol medications, or medicines for treating diabetes, adding biotin can impact your symptoms. Only very rarely does anyone have an experience that is life-threatening, while they are taking biotin. There is just one case recorded where a woman who had a lung and heart condition called eosinophilic pleuropericardial effusion took high doses of vitamins B7 and B5 and developed a life-threatening interaction. Once this woman stopped using the supplements that contained biotin, her symptoms dissipated and then ceased completely. It’s not known currently what role each vitamin had, or whether it was the combination that caused her serious symptoms. Although you’ll want to exercise extreme caution in not taking biotin in high doses due to the potential of serious side effects, biotin is a vital nutrient in the complex of B-vitamins. It helps to promote growth and your overall health. This nutrient is responsible for carrying carbon dioxide in the body, in what is known as the tricarboxylic acid cycle (TCA) cycle. It is helpful in converting carbs, proteins and fat into glucose energy, which promotes a metabolism that functions at its peak efficiency. Biotin, as we mentioned, also aids in the maintenance of healthy nails and hair, preventing both from becoming dull and brittle. Biotin can help in the management of diabetes symptoms, as well as the symptoms experienced by people who have high cholesterol or who suffer depression. Biotin helps your body to more effectively metabolize carbohydrates, which helps to manage optimum blood sugar levels. Some types of medical treatments could require that you take high biotin doses. For example, treating Candida albicans may require people to supplement their diet with up to 500 mg of biotin daily, to manage these yeast infections. Some health care providers also use high biotin doses to treat diabetic patients, since this vitamin increases your natural insulin sensitivity, while also increasing the enzymes that aid the body in processing sugar. There isn’t a recommended daily allowance of biotin currently, since it is only in rare cases that people have a biotin deficiency. As we mentioned, the dosages for children are lower than most adults can tolerate. No one should take anything more than small daily doses of biotin, without a physician’s direct oversight. This will prevent any potential side effects.